Savvy Spending: Menchie's Frozen Yogurt: New APP will give you FREE $5 in Menchie's Money! Menchie's Frozen Yogurt: New APP will give you FREE $5 in Menchie's Money! Did you hear the big news? Menchie’s now has an app! 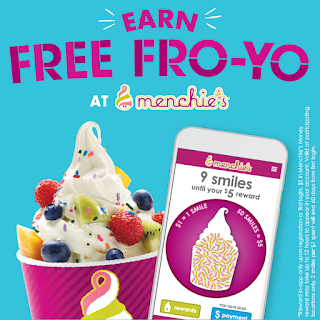 Download today from the Apple App Store or Google Play Store and earn FREE $5 in Menchie’s Money and 60 days of double smiles! You also get $5 in Birthday Rewards when you join.